I wonder what went through Matt Hancock’s head when he decided to launch his first app. The Conservative MP for West Suffolk wanted a way for his constituents to raise issues with him, without needing to attend a surgery in-person. How did he think it’d be received? 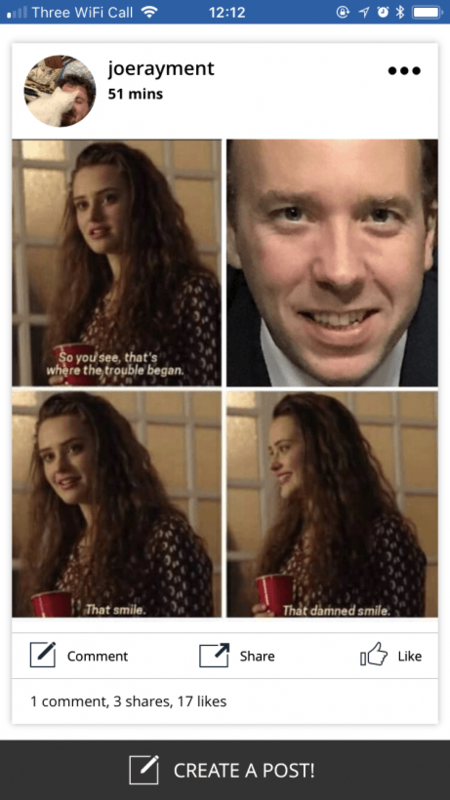 Would his constituents love it? Obviously, since I’m writing this article, we both know that something went amazingly (and amusingly) awry. The app launched earlier this morning. Hell, its press release landed in my inbox at 6:54 AM. At the time of writing, it’s not even lunchtime and it’s already filled with trolls and other piss-taking miscreants, who have re-purposed it for their own amusement. 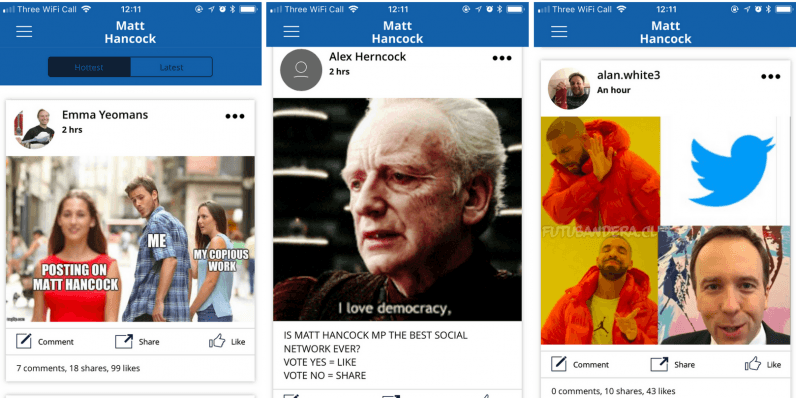 The app’s most prominent feature is called “Have your say.” It looks and works a bit like Facebook’s Newsfeed. Posts appear in real-time, and can contain text, photos, or both. Curiously, anyone can post, not just those living in Hancock’s rural constituency. 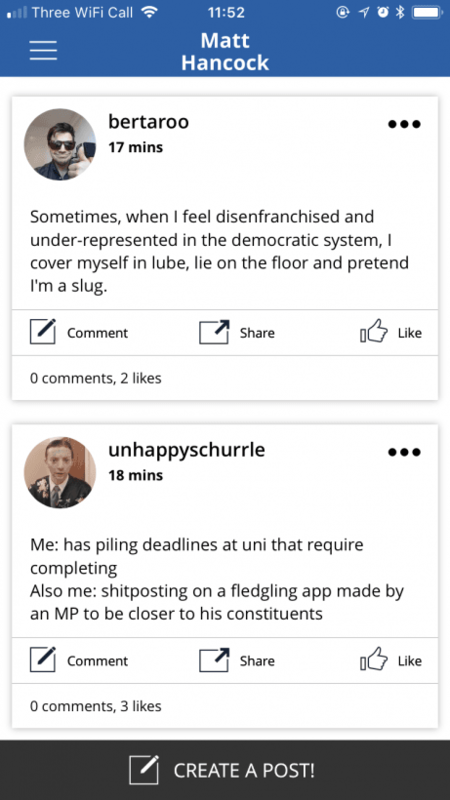 Amusingly, there’s also a spoof Matt Hancock profile which uses hashtags like “#securingtheyouthvote.” Enough said. 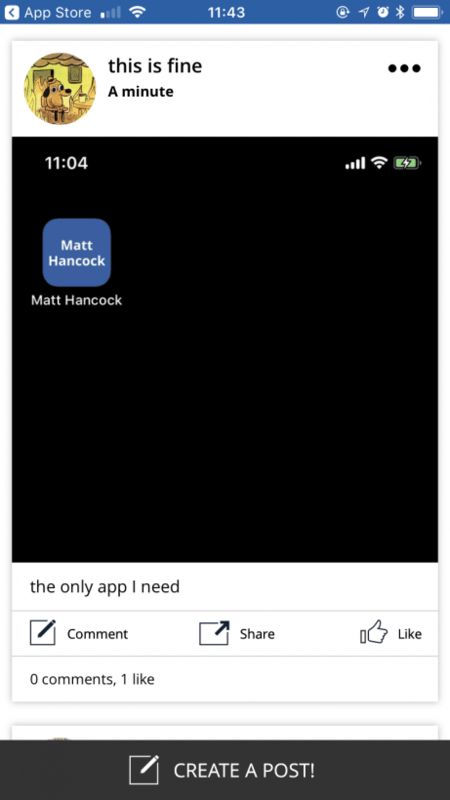 During account creation, the choice to name the app Matt Hancock creates some awkward moments, with system alerts noting that “Matt Hancock would like to access your photos”, “Matt Hancock would like to access your camera” and, on the buggier Android version of the app, “Matt Hancock keeps stopping”. Some users have been prompted to use Touch ID to open Matt Hancock. Um. 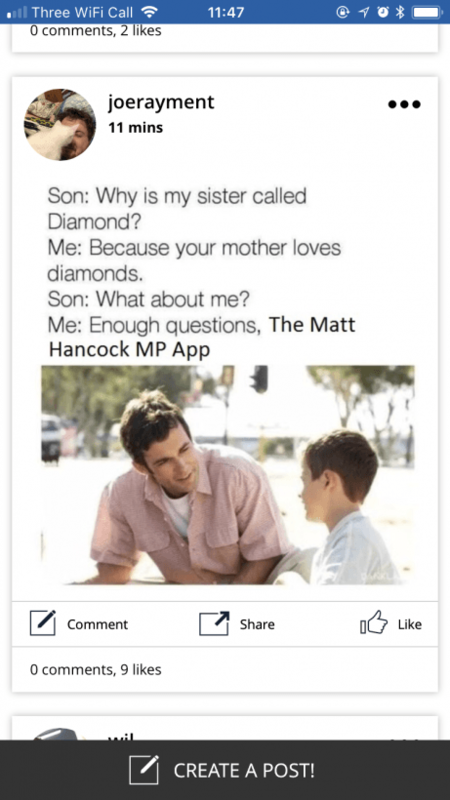 This ham-fisted attempt at digital engagement is funny, not least because Matt Hancock’s government portfolio is tech. He’s the Secretary of State for Digital, Culture, Media, and Sport. Surely he should have known that this would happen? Then again, since he first learned about Uber in 2014, perhaps not. That, obviously, didn’t happen, but there are some amazing memes on there. 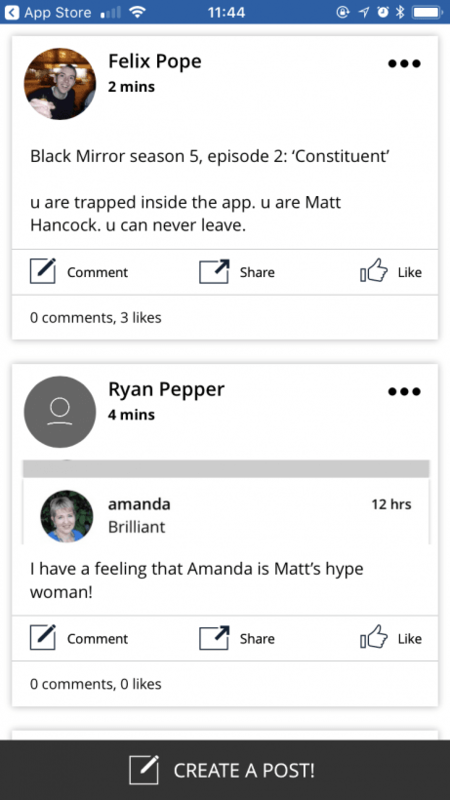 In the meantime, I’m taking bets on when Matt Hancock will put his app to pasture. Given the fact that its core feature has been completely derailed, and bad press is mounting, I’ll give it a week.